NMM 12882. 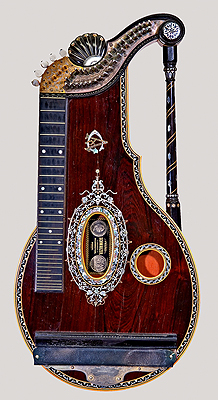 Alpine zither (Arion harp zither) by Franz Schwarzer, Washington, Missouri, 1888. 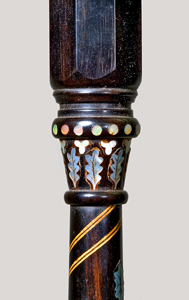 Custom Special model. 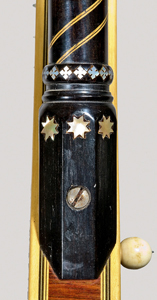 Serial number 2988. 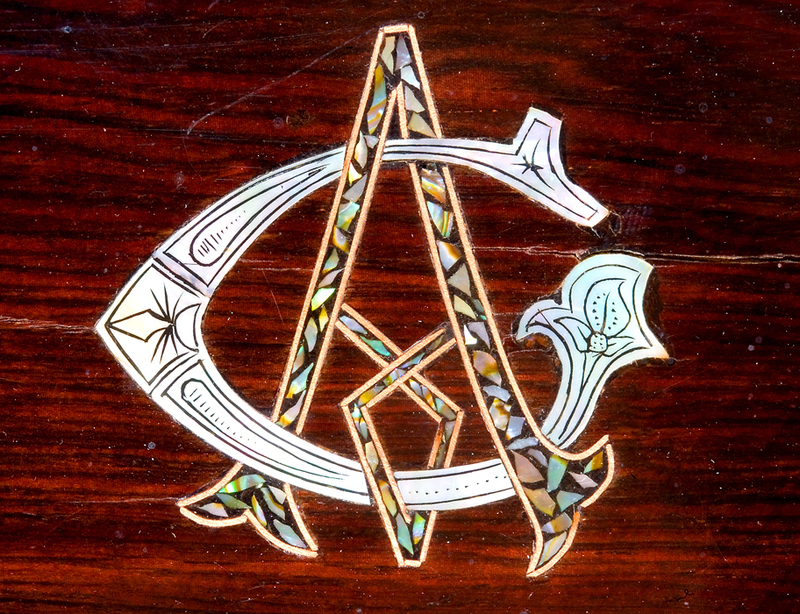 Fabric lettering glued to case lining: OBSEQUIO DE / EPIFANIO ALVAREZ / A SU HIJO / GUILLERMO. / S. PABLO, M. 43 strings (5 melody, 38 accompaniment). 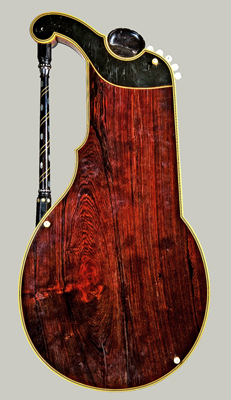 Body: 770 mm long, 395 mm wide; fretboard: 425 mm long; 60 mm wide. Paul and Jean Christian Collection, 2006. 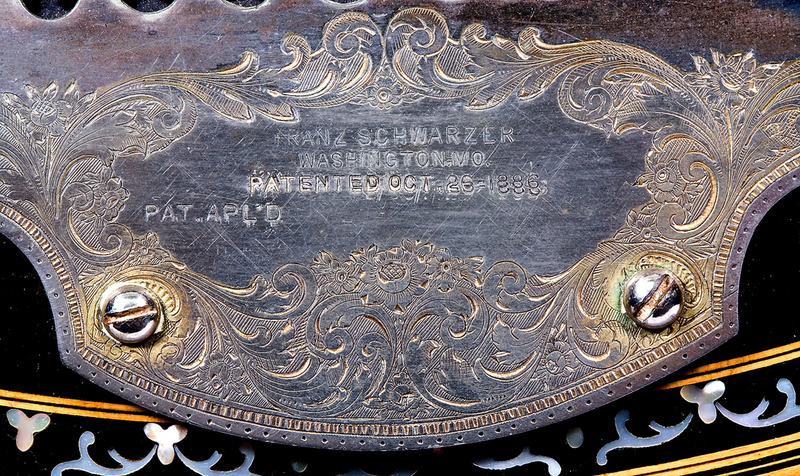 The Schwarzer story is that of the quintessential 19th-century immigrant. 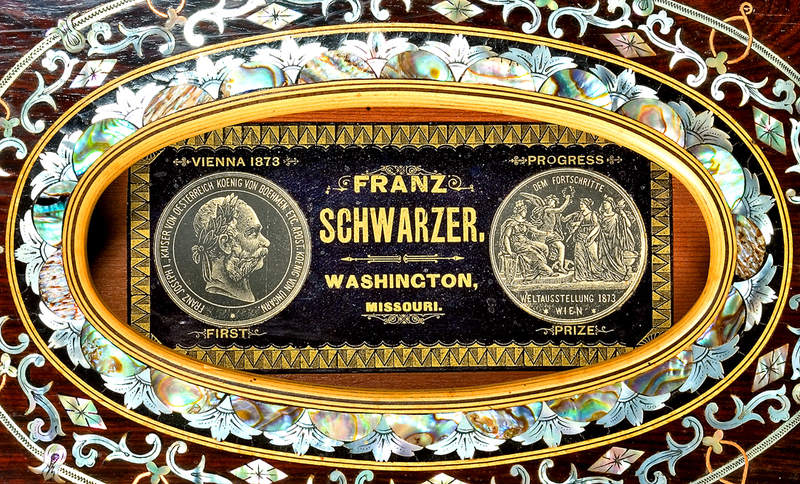 Holding the dream of success and with well-honed skills as a European zither and furniture maker, Franz Schwarzer (b. Olmutz, Austria, 8 October 1828-d. Washington, Missouri, 23 February 1904) and his wife, Josephine (d. 1912), left the failing economy of their native Austria and moved to America in 1864, eventually settling in Washington, Missouri. With the end of the Civil War, it was to be the beginning of a 'golden era' in American life, a time filled with great innovation and prosperity. 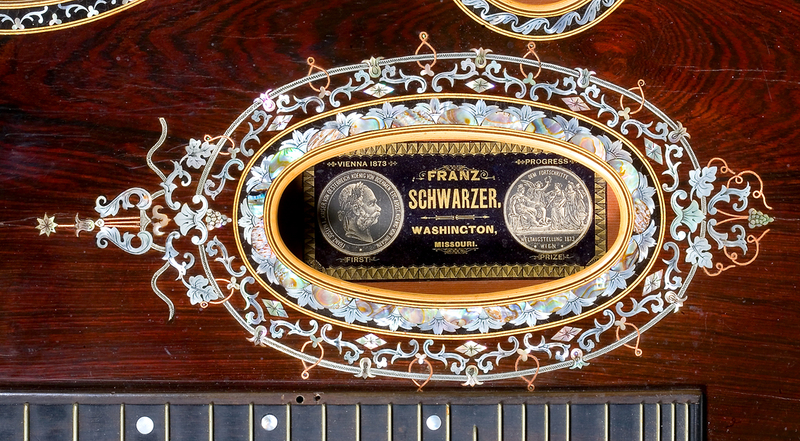 Taking full advantage of the hospitable business environment, Schwarzer began building zithers, importing the German-silver frets, mother-of-pearl inlay, ivory, and wood veneers from Europe. In 1873, he entered three of his zithers into the International Exhibition in Vienna and won the coveted Gold Medal of Progress. 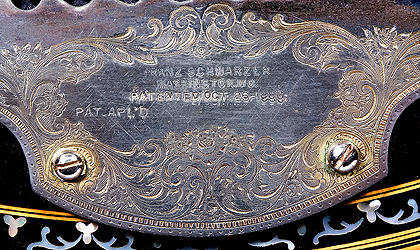 "Franz Schwarzer established his plant in 1864, and has supervised the output personally ever since. 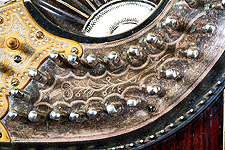 Such long experience guarantees the zither he produces, signed by his autograph--like an Amati violin--to be what they should be. Some day, in the twenty-fifth century, perhaps, Schwarzer zithers of 1864-99 may be as much sought after as seventeenth century Cremona fiddles. His own aim is to make good ones, not merely cheap ones, and they can last as long as the violins of the old masters." 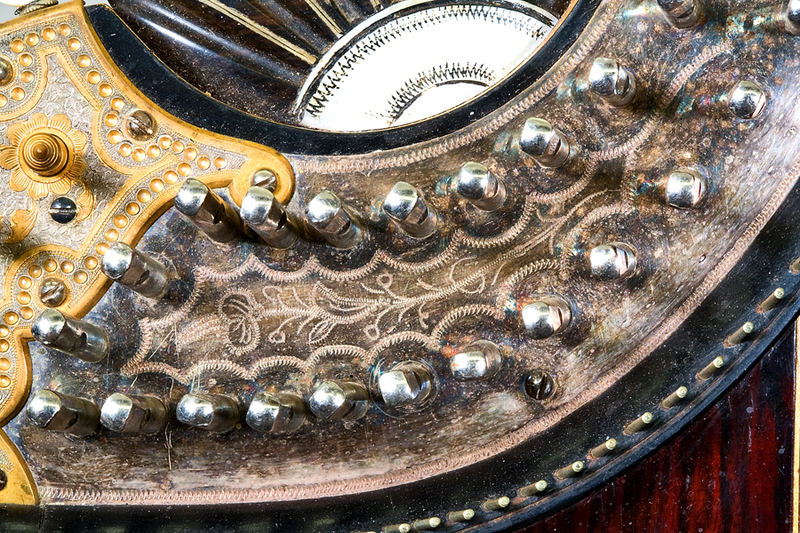 Schwarzer's 1898 catalog includes a sketch (#1126 at the far right) of the same monogram (GA, for Guillermo Alvarez) inlaid on this zither. 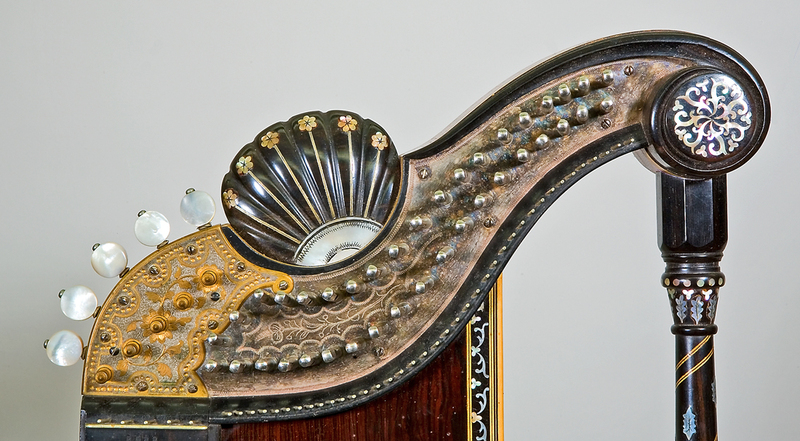 According to a study of Schwarzer's life and work, "Schwarzer designed, often with the help of his wife, the inlay patterns on the top and edges of the instrument[s]. 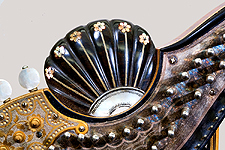 In the early years of the factory he did all of the finer work . . . . The veneer for the top of the zither was cut from rosewood, tulipwood, mahogany, or some other finish wood. 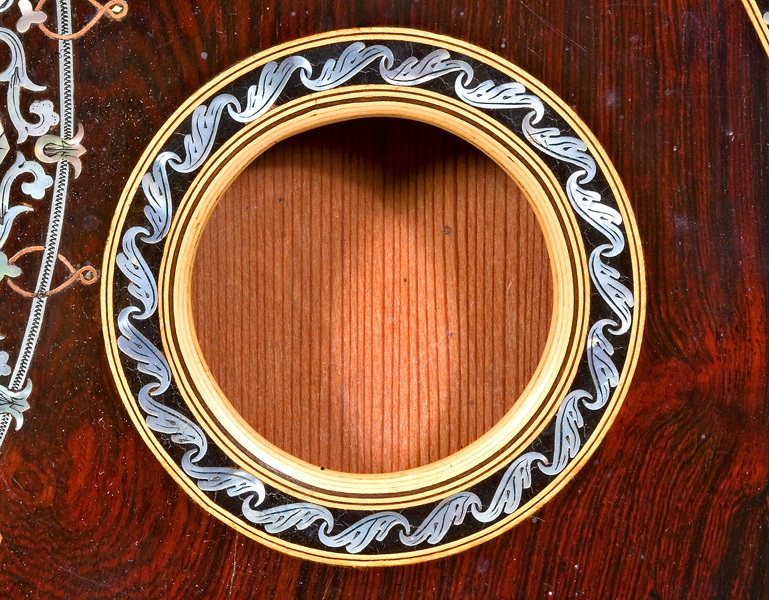 The design for the inlay was then carefully traced, one section at a time, on the veneer. 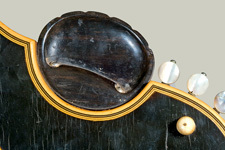 With small knives, usually made in the factory, the design was cut out of the veneer; the tiny pieces of mother-of-pearl were 'laid in' the appropriate places in the open area, matching not only the cut edges of the veneer, but also creating the pattern in the open area. 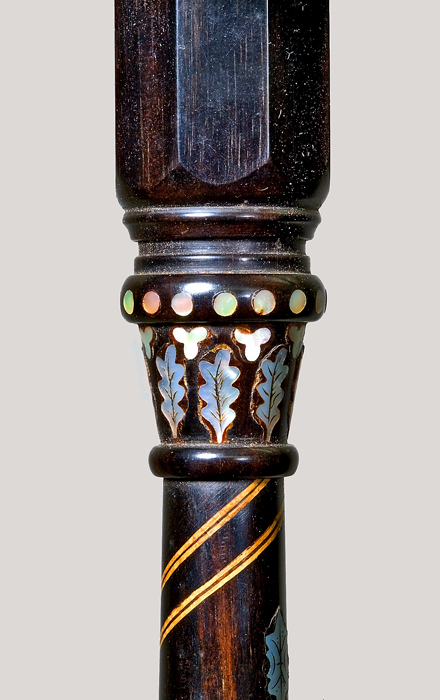 Then glue and ebony sawdust were mixed together, smeared over the inlay, and allowed to dry. After the glue had set, the total surface was slowly sanded, removing the excess glue, and leaving the polished inlay in the black ebony background." 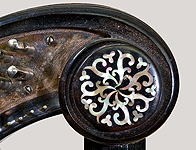 "Because of the tension created by fitting the small pieces together, and the strain on the eyes, only short periods at one time could be spent on the inlaying process. . . . on the more complicated designs, the inlaying might take several months; and on the intricately patterned models which sold for over $600, a full year was necessary to complete the inlaying. After the inlaid patterns were completed, the veneer was glued on the face of the instrument, leaving only the ivory trim and tulipwood burl to be fitted and glued to the edges of the instrument." 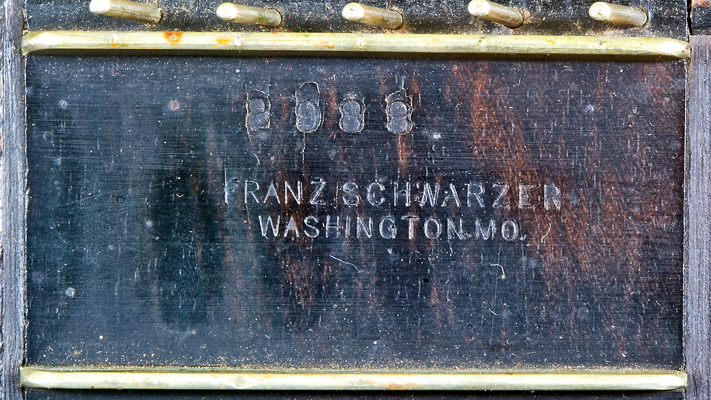 Excerpted from Thomas M. Davis and Franz R. Beinke, "Franz Schwarzer: Missouri Zither Maker," Missouri Historical Review 60, No. 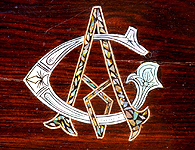 1 (October 1965): 24-25.